Worst Best Picture: Is The English Patient Better or Worse Than Crash? In “Worst Best Picture” we search every single Best Picture Oscar winner of all time from 1927 to present to uncover the worst of them all. Conventional wisdom says that 2005’s winner Crash is the worst winner in history. We won’t stop until we’ve tested every last one. Read the the first, our review of Crash, here. Posts will be relatively spoiler free, but there may be some details revealed. Today’s installment is the 1996 winner The English Patient. Is it better than Crash? That’s sort of the weirdness of the whole process. Does Casablanca need to be compared with Rocky to determine anything? Maybe not, but at the very least, the Academy has a chance every year to name one movie literally “Best Picture” and if they pick one over another, they are saying it is better. That seems like a simple thing, but there are so many times when you look at two movies nominated in the same year and you just can’t believe it. There are many famous snubs — Crash beating Brokeback Mountain is the most famous, see I told you people — but none are stranger now than The English Patient over Fargo. That kind of thing is why I started writing these. I had to know if there was some better example of a travesty on this list. I had to search everything. I had to go through every single time someone who was given the power to say so said “Best Picture.” I put The English Patient off because I was worried it might be the one. I didn’t want to run out of steam, so I knew I had to wait on the supposed biggest mistake in Oscar history (aside from Crash). You’ll have to wait until the end for the official answer re:Crash, but honestly, The English Patient is nautical miles worse than Fargo, and it’s really odd that anyone could watch both movies and not see that. You have to wonder if Fargo perhaps gained more momentum over the years rather than quickly or if the Coen brothers’ success after Fargo has elevated it. Whatever the case, The English Patient can rightfully be considered a snub. I’ll sign that document, bring it to me. It’s the story of “the English patient” (Ralph Fiennes), a badly burned and wounded man who is tended to by a nurse (Juliette Binoche) who has lost her taste for the war. The patient is dying, the nurse is in love with a bomb defuser (Naveen Andrews) who is constantly in danger, and they’re all joined by Willem Dafoe’s crazy thief character, who has no thumbs. If it sounds convoluted, then good, because it really, really is. 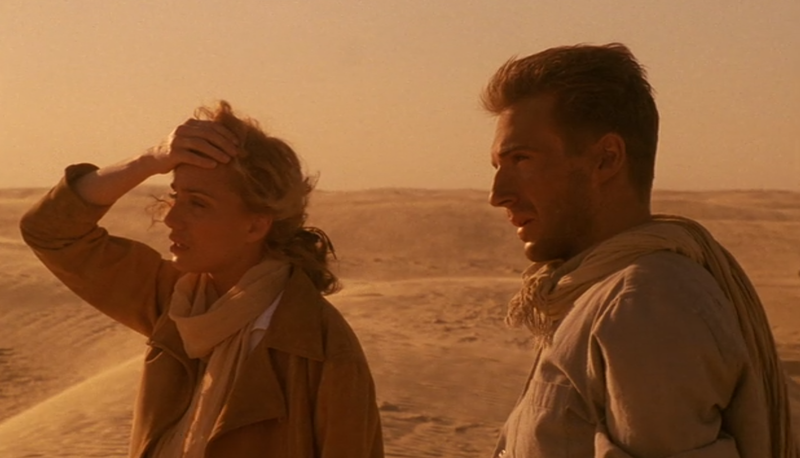 The English Patient drags through these characters with a narration provided by Fiennes as he recounts how he became “the English patient.” Much of his past is lost to him, but other parts are extremely specific and must be told in great detail. The movie correctly guesses that there are only two things anyone cares about in a Best Picture winner — love and war — but it misses a chance to expand some interesting characters. Dafoe pops in and out of the narration in brief moments and always offers the hope that everything will get interesting, but alas, we need more stories of forbidden love and terrible strife. “Boring and beautiful” is a fair epitaph for The English Patient. It’s not terrible by any means, but the patient’s stories of a wild affair and the nurse’s doting and caring are only so interesting, and they keep rehashing similar moments long after both of them have established who they are. If every line of dialogue must advance the plot, The English Patient could be a short film. After watching it, I feel mostly OK about the whole experience, but in the process it can be frustrating to watch the same thing again and again. The Best Part: Willem Dafoe is generally the best part of everything he’s in, and this is no exception. His character has no thumbs, which is shown during an early visit when he tries to hand the nurse an egg and can’t hold on to it. The reveal of how he lost them is the best part of the movie, no question. The Worst Part: The whole Fargo thing, maybe? If I have to pick something actually in the movie, I’m tempted to pick a pretty big spoiler, but I’ll instead go with the nurse’s relationship with the bomb defuser. The entire thing occupies about six minutes of screentime in a three hour movie, but we’re supposed to believe it defines her? The patient’s love story gets somewhere around three hours of the three-hour thing, and the mix makes everyone’s motivations a little tough to believe. Is It Better or Worse than Crash? The two great crimes of The English Patient are that it focuses on the wrong things and that it beat Fargo, a much better movie. The year Crash was nominated, everyone was certain that Brokeback Mountain would crush it, but even if the rumor that everyone was too afraid of the subject matter is true, Good Night, and Good Luck was also nominated, and that’s a fantastic movie. The crimes of The English Patient make it pretty unwatchable, but they don’t match up to those of Crash. While they’re both probably the two most obvious snubs, I don’t think The English Patient is even one of the five or ten worst, so there’s no real comparison to be made. Before I jump into the point I want to make, I’d like to walk you through my thought process of getting there. I sat down to watch the series finale of Dexter, hoping to find some angle to discuss about jumping into a series-ending episode after not watching the three seasons prior. About halfway through, it dawned on me that the end-game scenario most fans were rooting for was for two serial killers to get out of the country. These people literally hacked their victims into bits and the audience was rooting for them to escape? Something’s wrong here. It’s not news that television audiences are enamored with the genre “Bad Men Doing Bad Things.” We have Dexter, Mad Men, Breaking Bad…the list goes on and on. What makes these stories work is that, despite their reprehensible actions, the actors portraying the leading men bring enough to the roles where it doesn’t feel wrong to root for Don Draper as he cheats on (another) wife or to hope that Walter White becomes the drug kingpin he aspires to be. For as perfect as those shows are (I’m not including you on this list, you know what you did, Dexter) they have one glaring flaw: For the most part, the female roles are pushed aside due to the intrigue of the Bad Man Doing Bad Things. Take Breaking Bad for example. I fully admit that it’s my favorite show of all time. However, the fan base was furious at the lead female character because she…wanted a drug dealer away from her kids? The only imperfection on this show was its fans. How could you honestly judge someone for wanting to be out of a bad situation? All of her actions were natural, ones any normal person would have, but because she was in the way of the hook of the show the fan outcry was overly negative and completely unjustified. But…then there’s Fargo, a show very loosely tied to the movie of the same name, but it also falls into the aforementioned genre. There are some very bad men and they are doing some very bad things. It could easily be another show where the performance of the leading villain (in this case, Billy Bob Thornton’s character Malvo) is the hook. Seeing the next step of his plan, and the gruesome trail of death that lies in his wake, is gripping. It’s addictive. It isn’t why I come back to it week after week, though. Fargo breaks the mold by finally introducing a strong female character that overcomes the appeal of the bad man doing bad things. 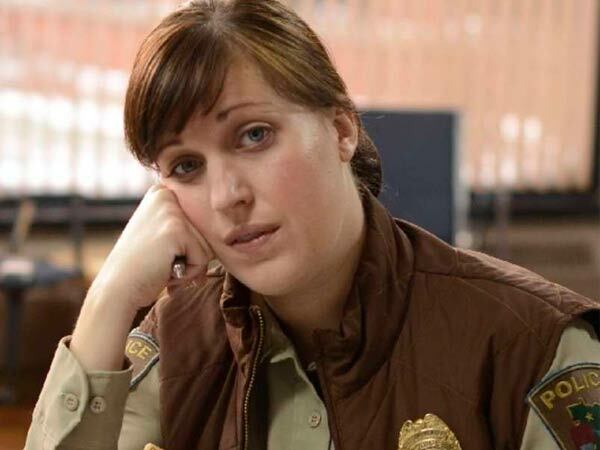 Allison Tolman (a name I’d never heard before) plays Molly Solverson, one of the only characters thus far to be the moral compass of the show. When I watch, I don’t care what the villains are up to. I want to know more about Molly’s story. I want her to win. She’s a wonderfully written, fully realized character. She overcomes the hook of the show, the black comedy and murder, as a shining beacon of justice and morality. I sincerely hope television writers take notice. The female role doesn’t need to be the put-upon wife or just used as a plot device to make the protagonist’s story more complicated. Molly surely does this on Fargo but it’s not done in a way to make the villains have to change their plans. Her story is the more important one. You sympathize with her more than whatever the stereotypical “cool” characters are doing (and, granted, they do some pretty interesting things in their own right). She’s a roadblock, and damn right she is. This isn’t to say other female characters on television aren’t well written – that’s not the implication. There are amazing performances, but in the eyes of the masses they get overlooked. Don Draper is a household name (even my parents know who he is), even though I would argue that Peggy Olsen should be, too. I hope this is finally turning the corner on televised dramas. Bad men will still be doing bad things, but more empowered women will be a part of the story and not just a plot device to be overlooked by the immorality if the leading man. In comedy, the male performances often unjustly overshadow the female ones. Sitcom characters Liz Lemon and Leslie Knope were able to overcome this and change TV comedy. If people pay enough attention, I have a feeling Molly Solverson is going to do the same for drama. Something, I may add, that is long overdue.